As loads factors go up in May, so do hopes at SpiceJet. Q1 Loss imminent. 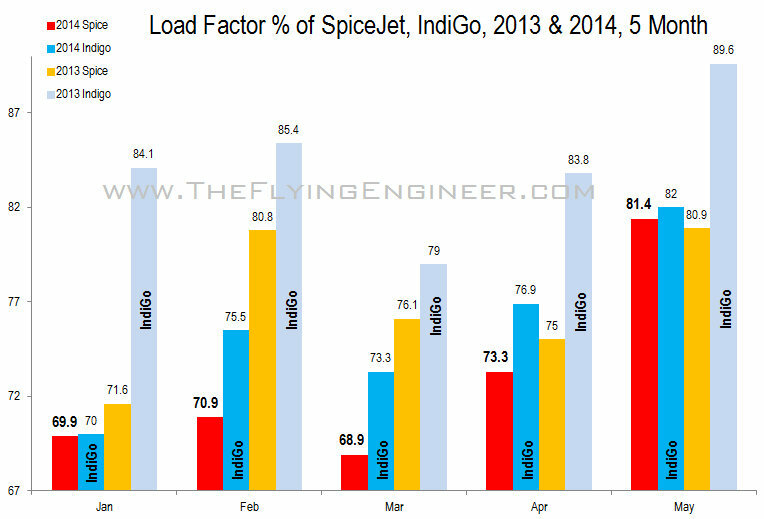 SpiceJet’s load factor in the May of 2014 has touched 81.4%, its highest in two years since the May of 2012, and is the first month in this calendar year to beat the load factors witnessed by the airline last year. It beats the previous year’s load factors for the same month, by 0.5%. While this is reassuring news, it must be noted that since 2010, May has been the month when SpiceJet witnesses its highest load factors. May and June are peak months for air travel, but it is only the second best period for IndiGo, which usually sees its best load factors in the month of December. Statistically, SpiceJet’s load factors slip after May. Loads factors for the month of July are expected to be lower, but it is not known if they are lower than the previous year’s. Effects of SpiceJet’s most significant market stimulation drive, the Re 1 fare sale which was held for the first three days of April, for travel between 01-July-2014 to 28-March- 2015, will be seen this month. Due to the sale, load factors are expected to go up, and according to the airline’s Chief Commercial Officer Kaneswaran Avili, the stimulation has yielded positive results in terms of higher non-promo fare bookings as well. With these multiple promotional sales, any higher bookings are a mix of promo fares and regular fares. If the market has been sufficiently stimulated, which will reflect in higher load factors, then the airline will generate additional revenue. But if even after the stimulation, if the load factors rise only slightly, or not at all, it may not generate the airline any additional revenue. If load factors drop, which is highly unlikely, it is the death bell for the airline. For example, SpiceJet’s Super Holi sale in March for travel between 14th April and 30th June 2014, and the Super Summer Sale in February for travel between April 1 and June 30, 2014, did not seem to have had an overall positive impact on the load factors for the months of April and May. Since the load factors were lower than the corresponding period in the previous year, it only meant that lesser people filled up the aircraft on average, and among that lesser set of passengers, even lesser actually paid a regular fare. As shown in The Flying Engineer’s analysis of SpiceJet, there is a strong correlation between load factors and operational profits. Considering that (look at the graph) the load factors in April and May have resulted in an average load factor that is 0.6% lower than last year’s load factors for the same months, and that some of that passenger set bought sale/promotional fares and not regular fares, and that the factors in June are expected to dip (based on statistical trends), it may be likely that for the Q1 for Financial Year 2014, SpiceJet may report a loss. But with the 0.5% in load factors in May, over last year’s, mild hopes are pinned on the second quarter of FY2104, which started yesterday. We do wish the airline all the very best, and hope to see it turnaround fast and strong, before the might of aggressively expanding TATA-SIA and AirAsia India, and the increasing capacity deployed by IndiGo and GoAir possibly choke the airline.